Each month approximately 200 volunteers contribute their time and energy to various activities within the library. Assignments range from helping children with homework to assisting with adult computer classes. 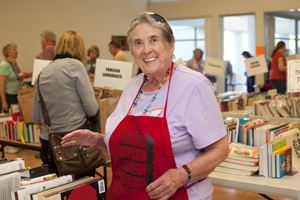 Applications for volunteer service may be obtained in the Grant R. Brimhall Library's Administration Offices, the Newbury Park Branch Library, or go to Become a Volunteer page. The Grant R. Brimhall Library and the Newbury Park Branch welcome adult and teen volunteers! Adults who wish to donate at least three hours per week to the library are encouraged to fill out the adult application form. Teens must be 13 or older and are interested in the Teen Volunteer Program should complete the teen application form. Once you have completed the appropriate application form, click the "Submit" button. Applications will be processed by the Library's Volunteer Coordinator Judi Bumstead, and you will be contacted for an interview when a suitable position becomes available. Thank you for your interest in becoming a library volunteer!